So… this is just weird. I’d love to know if any other authors have had this happen to them. People are roleplaying — sort of — in the reviews sections of some of my ebooks at Barnes & Noble online. The image above is from the reviews section for Pixel People. Obviously, they can’t exactly fit a lot in. I’ve played a lot of role-playing games in my time, and frankly, if a game I was in didn’t make it any farther than people giving uninspired descriptions of their characters, I wouldn’t have come back for the next session. Maybe the action is somewhere else. I haven’t checked the reviews on The Grapes of Wrath lately. maybe ‘Raven’ and (snicker) ‘Eclair’ are fighting some orcs over there. 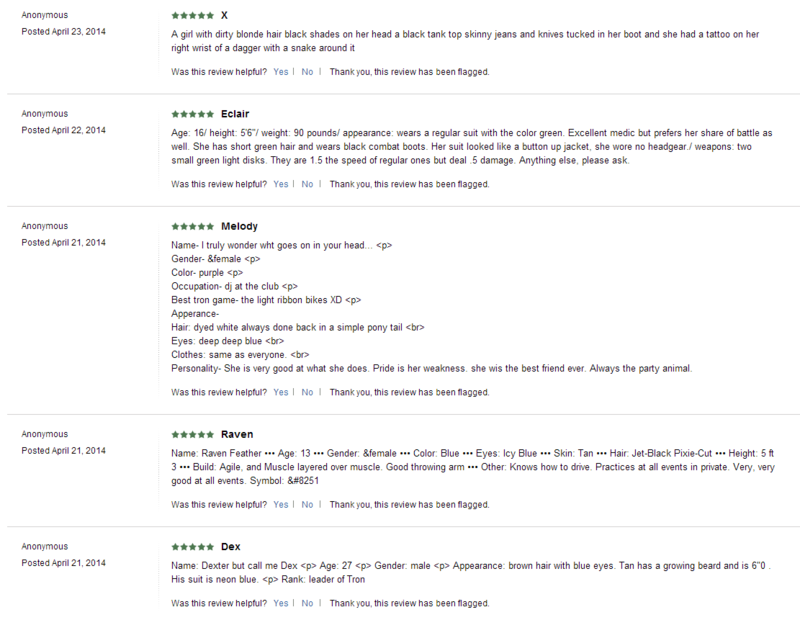 And, seriously, roleplaying in reviews? Seems like this would be a lot more efficient even in something as awkward as a thread in email with lots of CCs. Or, I don’t know, get a freakin’ blog and roleplay there? They’re free. For people engaging in an imaginative pursuit like roleplaying, this crowd seems pretty dim. Addendum, 7/31/14: A Twitter friend, @nihiofkdi, tracked down the answer. Apparently “Nook RP” is a thing. To each their own, but rather than putting junk in the reviews of innocent hardworking indie authors like myself, which may discourage folks from downloading (“What’s this crap, this isn’t a review. Is this author screwing with me? Well, forget that. I’ll just re-read some Harry Potter, thanks.”), why not just gather at a friend’s house and play some good old fashioned D&D? It’s more fun that way, not to mention someone usually brings tasty junk food. Yes, on Barnes and Noble it seems to be a thing. I noticed that one of my books had far more reviews there than was likely, and when I looked into it I saw just this kind of thing. It’s hysterical. I love it.